The "Burn Your Own Professional CD-ROM" article is a collection of information about creating a CD-ROM project. Includes information about designing cover art, working with replicators, avoiding contract problems, testing and more. information, video tutorials, live customer service representatives willing to help you use this product successfully has been the best experience I have ever witnessed in purchased downloaded software. I highly recommend this product if you need to make professional proposals with ease." This Burn Your Own Professional CD-ROM is included in an editable format that can be customized for your own needs. How do you write a Burn Your Own Professional CD-ROM document? 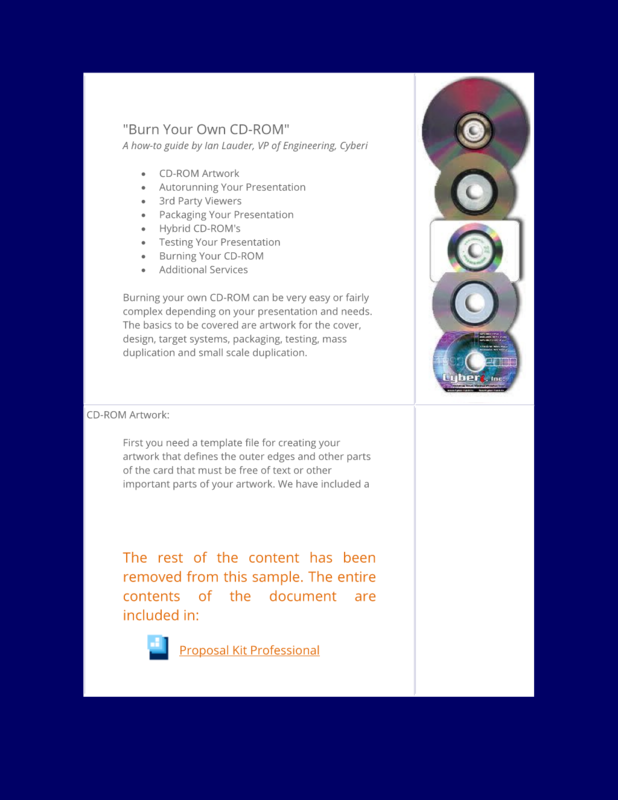 The editable Burn Your Own Professional CD-ROM document - complete with the actual formatting and layout is available in the retail Proposal Kit Professional.